Hot air rises and cold air falls—but how can we be certain? Jet planes screaming overhead leave shock waves in their wake—but, again, how do we really know? One way we know is from taking Schlieren photographs, which show up invisible changes in the air as streaky patterns of color or shades of gray. (The word "Schlieren" is pronounced sh-leer-un and comes from the German word for streaks.) Images like this have been widely used by airplane designers and space scientists for decades, though the basic technique is simple enough for almost anyone (with the right equipment) to try at home. Let's take a closer look at how Schlieren photography actually works! Photo: How does a plane's nose cut through the air? 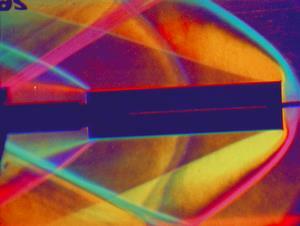 This colored Schlieren photo, taken in a wind tunnel, gives you some idea. The plane is the dark shape at the bottom, pointing up. The lines you can see are shock waves created as its nose cuts through the air. Photo by courtesy of NASA Ames Research Center (NASA-ARC). Photo: What difference does the shape of a plane's wings make to the shock waves it creates at supersonic speeds? Schlieren photos can tell you! Photo by courtesy of NASA Ames Research Center (NASA-ARC). You often see Schlieren photos in science books, but they're not widely used in newspapers, magazines, or other mass media, perhaps because they take a little bit of explaining. Even so, the basic idea is fairly easy to understand. How, then, can you make convection currents visible? Suppose you shine a lamp through the air where your coffee cup is standing. You probably know that light travels faster in substances that are less dense and slows down a little when it moves into denser substances. (That's why a straw or a spoon appears bent when it stands in a glass of water: light travels quicker in air than in water.) So light rays traveling through our hot coffee steam will travel a bit faster (and be bent or refracted less) than light rays traveling through cooler air nearby (which will travel slower and be bent more). With the help of a good light source and a mirror, we can make the fast light rays follow a slightly different path from the slow ones. If we stick a colored filter in their way, along with a camera, we can color the fast rays (say, red) before they enter the camera lens and make the slower rays a different color (say, green). What we end up with is a colored photo that reveals the swirling patterns of the air caused by the heat from our coffee: a Schlieren photo! How do you take Schlieren photographs? Photo: Art or science? The different colors in a Schlieren photo are caused by light traveling at different speeds through different parts of the airstream, so being bent to travel through different parts of a colored filter. This 1971 Schlieren photo was taken as part of early design tests of the Space Shuttle. Photo by courtesy of NASA Ames Research Center (NASA-ARC). There are lots of websites that describe the practical details very clearly and I'm not going to repeat them here (if you're interested, simply type "how to take Schlieren photography" into your favorite search engine). But here's the basic setup. You aim a collimated, point source of light (essentially, filtered and focused light) at a large, spherical, optical-quality mirror (your grannie's old mirror simply won't do—the surface will be too irregular and it will blur the light rays too much). You place your camera next to the light and put either a sharp knife blade or a filter with bands of color in front of it, so it partly obscures the lens. Then you simply place the object you want to photograph (say, your steaming hot cup of coffee) in between the light and the mirror. How does the photograph form? The filtered light passes twice through the hazy airstream near your coffee. Light rays traveling through cooler, heavier air are bent more than rays through hotter, lighter air so, after being reflected by the mirror, rays that have traveled through different parts of the airstream are shifted slightly to one side or the other. If you're using a colored filter, some rays pass through one of the colored areas while other rays pass through a different colored area. That's how the photograph your camera captures shows up differences in the air density as streaks of color. If you're using a knife blade instead of a colored filter, you get a black-and-white Schlieren photo with the density differences shown up as streaks of gray. One thing to note about Schlieren photos is that they give only a rough, visual impression of air density changes rather than the precise measurements you might make with computer models or wind-tunnel tests. In other words, this is a qualitative rather than a quantitative technique. Artwork (slightly altered and colored for added clarity) from US Patent 4,139,291: System and method for obtaining wide screen Schlieren photographs courtesy of US Patent and Trademark Office. 12 is a point source of light. 16 (red) is a condensing lens system. 14 (gray) is a small grating (roughly 5cm by 5cm with 400 lines per cm, or 2in by 2in and 1000 lines per inch). 20 (red) is a diverging projector-type lens. 22 (blue) is the fluid object being photographed (such as a disturbed airstream). 18 (gray) is a large grating made from steel rods (roughly 1/25cm or 0.5 inch in diameter and spaced 15cm or 40inches apart) with thin black nylon twine stretched between them. 24 (green) is a viewing screen on which an image of the object is projected. 26 (purple) is an ordinary camera for photographing the image on the screen. Light from the source is concentrated and focused by the condensing lenses, passes through the grating, which breaks it into multiple pieces, and then projected through the fluid object by the diverging lens on the other side. The fluid object refracts and shifts it slightly, forming a Schlieren image on the screen, which can be photographed in the normal way. What else can Schlieren photographs be used for? 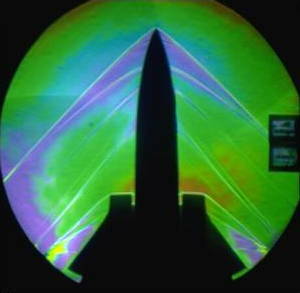 Most Schlieren photos are used for studying the air movements caused by fast-moving objects, such as airplanes, bullets, space rockets, and so on. Generally, they're taken in wind tunnels, though it's also possible to take Schlieren photos of real planes in flight using the Sun as the light source (like the one shown here). You can also take simulated versions of Schlieren photos using computer programs that mimic the process. This technique is usually called synthetic Schlieren photography. Photo: It's possible to take Schlieren photos of real planes. This one was taken by Dr. Leonard Weinstein of NASA Langley Research Center in December 1993 and shows a T-38 flying at an altitude of 4,000m (13,000ft), at a speed of Mach 1.1, over Wallops Island, MD. Photo by courtesy of NASA Armstrong Flight Research Center. 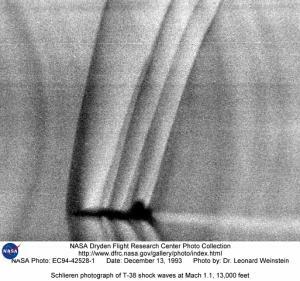 It wasn't a person called Schlieren; as we saw earlier, that German word ("streaks") describes what the photos look like. The technique was actually developed by German physicist August Toepler between the late 1850s and the mid 1860s. This is What Piercing the Sound Barrier Looks Like by Nicholas St Fleur, The New York Times, September 1, 2015. A stunning example of Schlieren photography from NASA. The Mysterious Cough, Caught on Film by Denise Grady, The New York Times, October 27, 2008. An overview of what Schlieren photography can be used for in real life. Schlieren and Shadowgraph Techniques by Gary Settles. Springer, 2001. A practical guide, including the history of Schlieren photography, from one of the world's leading Schlieren practitioners (Distinguished Professor of Mechanical Engineering at the Pennsylvania State University). 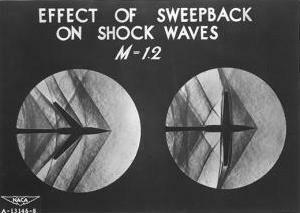 August Toepler—The first who visualized shock waves/a> by P. Krehl and S. Engemann, Shock Waves (1995) 5: 1. https://doi.org/10.1007/BF02425031. Aerodynamic Measurements by Giuseppe P Russo. Woodhead, 2012. Explains different types of measurement for analyzing subsonic, supersonic, and hypersonic flight. Fluid Mechanics Measurements by Richard J. Goldstein. Taylor & Francis, 1996. Describes and compares various ways of making measurements in wind tunnels and elsewhere. 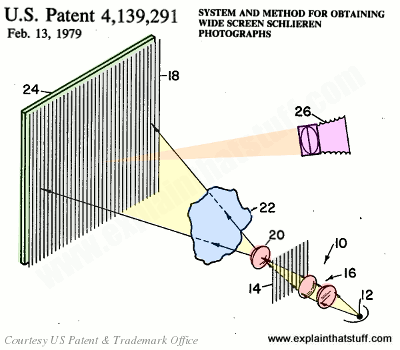 US Patent 4,139,291: System and method for obtaining wide screen Schlieren photographs by Parthasarathy Shakkottai, NASA, February 13, 1979. NASA has been a pioneer of Schlieren photography. This patent describes a simple and cost-effective way of using the technique to produce large-scale images. US Patent 9,232,117: Digital Schlieren imaging by Benjamin Buckner et al, Metrolaser, January 5, 2016. A modern, digital method of using a type of Schlieren photography known as complementary-grid focusing for taking much larger photos.